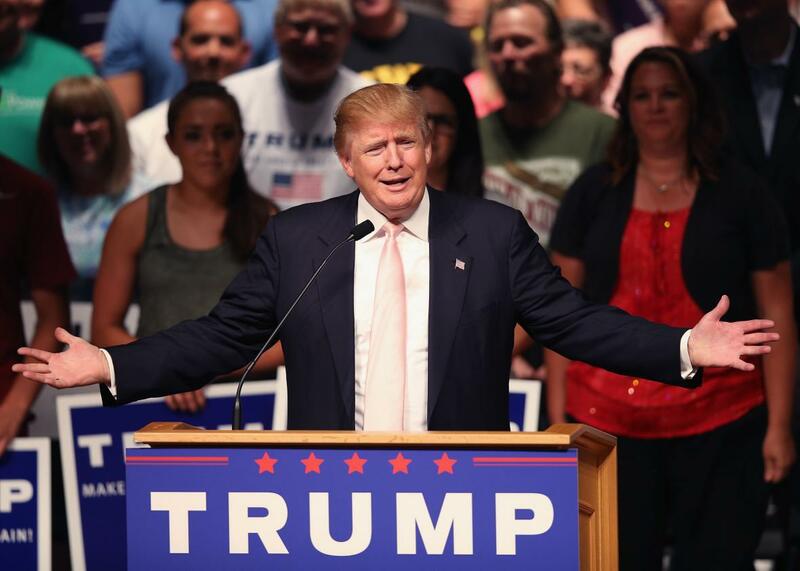 Donald Trump: Why the Republican candidate isn’t going away anytime soon. He’s not a Republican phenomenon. He’s part of a troubling global movement toward populism and nationalism. Donald Trump speaks to guests gathered for a rally on July 25, 2015 in Oskaloosa, Iowa. To understand the rise of Donald Trump, you’d do well not to fixate on the fact that he’s running under the Republican banner. During Thursday night’s Fox News debate, Trump made it clear that failing to secure the GOP nomination wouldn’t stop him from exploring an independent candidacy. And honestly, he’d be crazy not to. Trump is very far from a Republican regular. He represents an entirely different phenomenon, one that bears little resemblance to garden-variety American conservatism. That’s why Republicans shouldn’t fool themselves into believing that one lackluster debate performance will send him packing. Go to almost any European democracy and you will find that the parties of the center-right and center-left that have dominated the political scene since the Second World War are losing ground to new political movements. What these movements have in common is that they manage to blend populism and nationalism into a potent anti-establishment brew. One of the first political figures to perfect this brand of politics was the very Trumpian Silvio Berlusconi, the Italian media tycoon who rose to power as part of a coalition of right-of-center parties in the mid-1990s, and who has been in and out of power ever since, dodging corruption charges and worse all the while. More recently, the miserable state of Europe’s economies has fueled the rise of dozens of other parties. Britain’s Labour Party has been devastated by the rise not only of the leftist Scottish National Party, but also by UKIP, a movement of the right that has been growing at Labour’s expense by campaigning against mass immigration, and by largely abandoning what had been its more libertarian line on the welfare state. UKIP’s leader, Nigel Farage, has a penchant for bombast that endears him to his working-class base, which might sound familiar to you. The Danish People’s Party went from the far-right fringe to become Denmark’s second-largest party by combining anti-immigration sentiment with a commitment to protecting social programs that serve native Danes. In neighboring Sweden, the Sweden Democrats are trying to pull off a similar feat, which is challenging in light of the party’s neofascist roots. France’s National Front has been a major player for decades, yet under its current leader, Marine Le Pen, is on the verge of a major electoral breakthrough, despite near-constant infighting. The most successful populist movements in southern Europe—Podemos in Spain, the Five Star Movement in Italy, and Syriza in Greece—are generally on the left rather than the right, yet they’re just as aggressively anti-establishment as their right-wing counterparts. So what does any of this have to do with Trump? As a political outsider, Trump has the freedom to say or do almost anything. While every other Republican on stage Thursday night made an effort to demonstrate their conservative bona fides, justifying this or that heresy by invoking the Bill of Rights or the memory of the sainted Ronald Reagan, Trump had no compunction about breaking with ideological orthodoxy. When asked about his past support for a Canadian-style single-payer health system, Trump didn’t back down. Instead of repudiating his past position, or apologizing for it, he said that “as far as single-payer, it works in Canada. It works incredibly well in Scotland. It could have worked in a different age, which is the age you’re talking about here.” Why didn’t Trump reverse himself? It could be that he recognizes that there are many GOP voters who are just as passionate about defending Medicare as they are about protecting America’s borders, and that the prospect of Medicare-for-all might not faze them. Or it could be that he realizes that the forces that have pushed him to the top of the GOP primary fight are far bigger than just the Republican Party, and he need not toe the line to keep his candidacy alive.